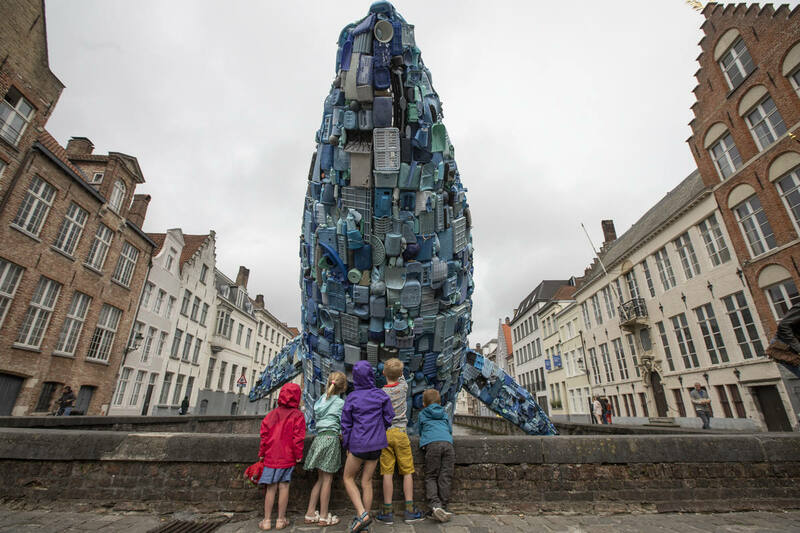 Five tons of plastic waste from the Ocean, steel and aluminum frame compose Skyscraper (The Bruges Whale), a public art installation which shows us why we need to change how we use and dispose of plastic in the world today. 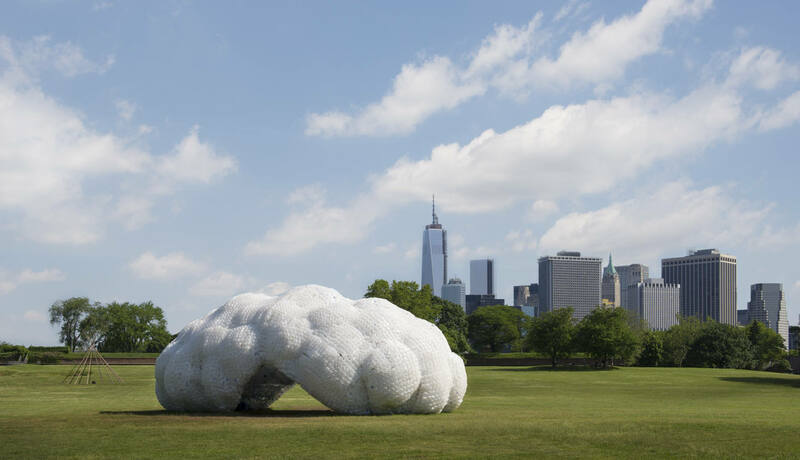 Head in the Clouds pavilion is made of 53,780 recycled plastic bottles, the number of plastic bottles thrown away every hour in New York City. StudioKCA is the art studio behind these “mind shaking” projects. They explains us why. StudioKCA is an award-winning architecture and design firm led by Jason Klimoski and Lesley Chang based in Brooklyn, New York with projects ranging in scale and complexity from lighting fixtures and interiors, to public installations, sculptures and buildings in New York, Vermont, Nevada, Wisconsin, Brazil, Taiwan, and Papua New Guinea. 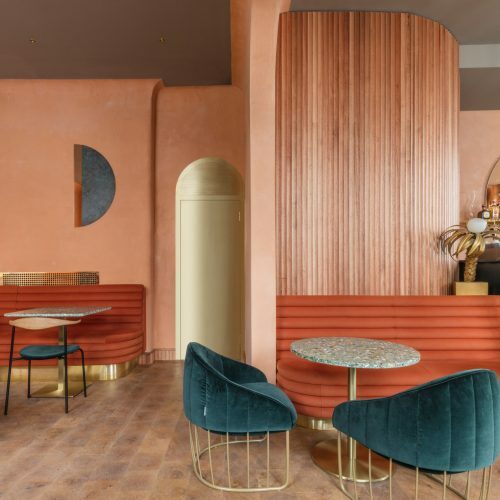 We love two of its last projects. The organizers of the 2018 Bruges Triennial, approached Jason Klimoski and Lesley Chang of StudioKCA to create an art piece interpreting the idea of the “liquid city”, a concept that defines the city as an ever changing set of consumer transactions, whose identity is in flux as cities grow more and more connected through globalization. 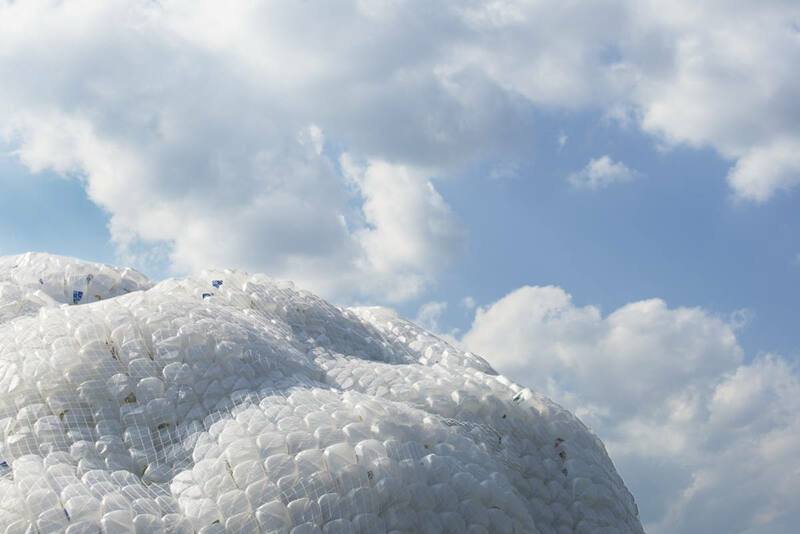 Their first thought led them to thinking about the biggest liquid city on the planet (the ocean), how it connects us all, and how the waste produced and consumed in our cities, specifically plastic waste, ends up in the ocean. Then, they read: “Scientists estimate there are 150 million tons of plastic trash in the ocean right now, with an estimated 8 million tons added every year. 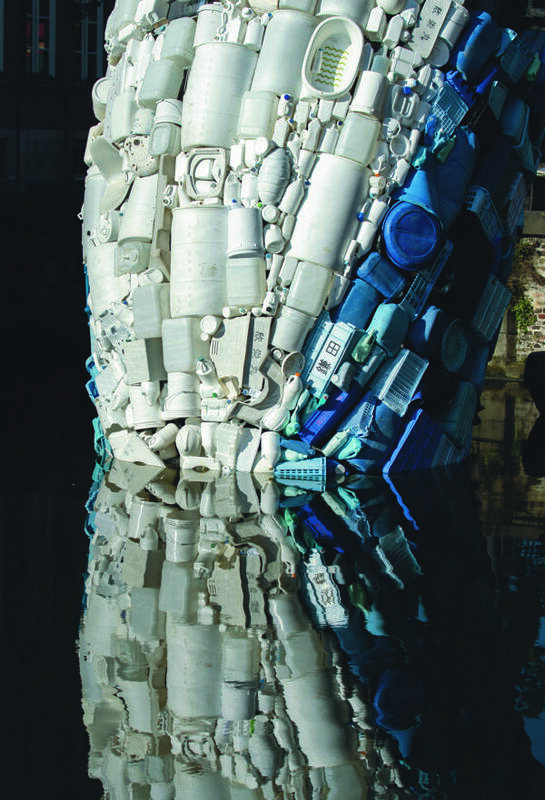 That means, pound for pound, there is more plastic waste from our cities swimming in the ocean than there are whales”. 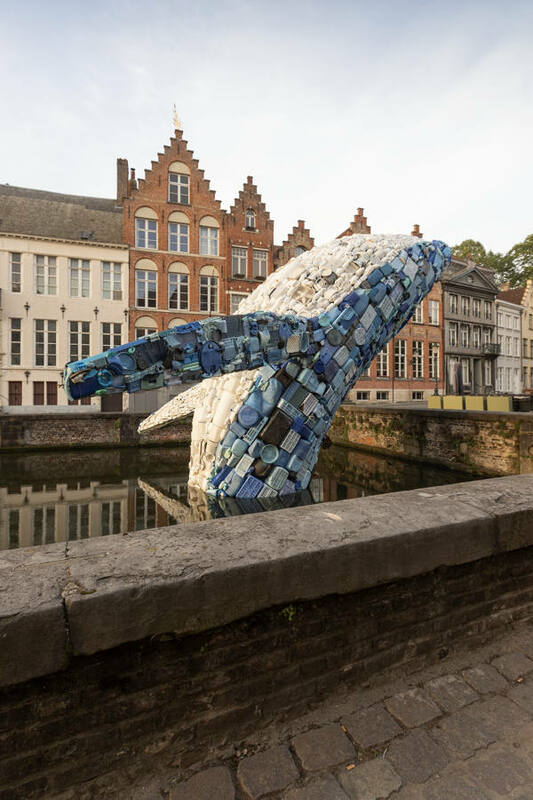 They proposed collecting as much plastic waste out of the oceans that we could in 4 months, and shaping that waste into Skyscraper, an almost 4 story tall whale pushing out of one of Bruges' main canals, and arching over historic Jan Van Eyck Square at the city's center. Skyscraper was selected along with 14 other installations proposed by a select group of international artists and architects to be brought to life for the event. Head in the Clouds is a public pavilion, with an area for performance and seating, located in Governors Island, New York. The project was the winning proposal selected from over 200 submissions to the 2012-2013 City of Dreams international pavilion design competition. The competition asked architects and designers to imagine “‘the city of dreams”, and propose a temporary pavilion that could be built offsite, assembled on the island, and provide shelter for approximately 50 people. "A whale, breaching from the water, is the first "skyscraper of the sea", and as the largest mammal in the water, it felt like the right form for our piece to take in order to show the scope and scale of the problem.” - Jason Klimoski, Principal, StudioKCA. 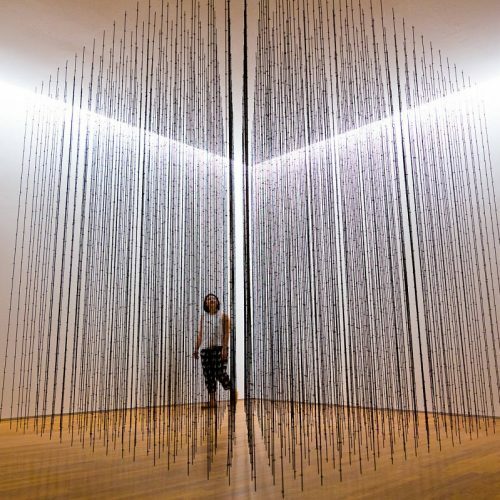 Made of 53,780 recycled bottles - the amount thrown away in New York City in 1 hour– Head in the Clouds is a space where visitors can enter into and contemplate the light and color filtering through the ‘cloud’ from the inside, out. 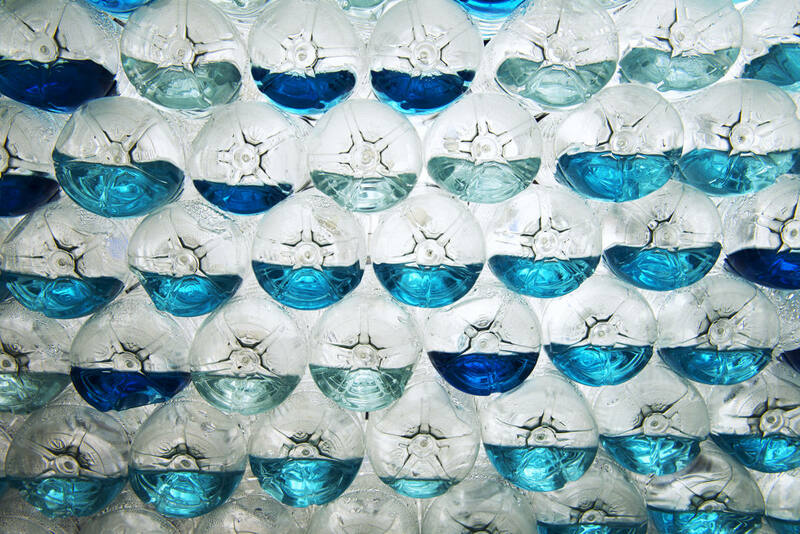 A series of ‘structural pillows” made from 1 gallon jugs form the exterior, while 16 and 24 ounce water bottles filled with varying amounts of organic blue food coloring line the interior. Sand, water, and a curved aluminum diagrid provide structural integrity and create a small seating/dreaming area at the base. 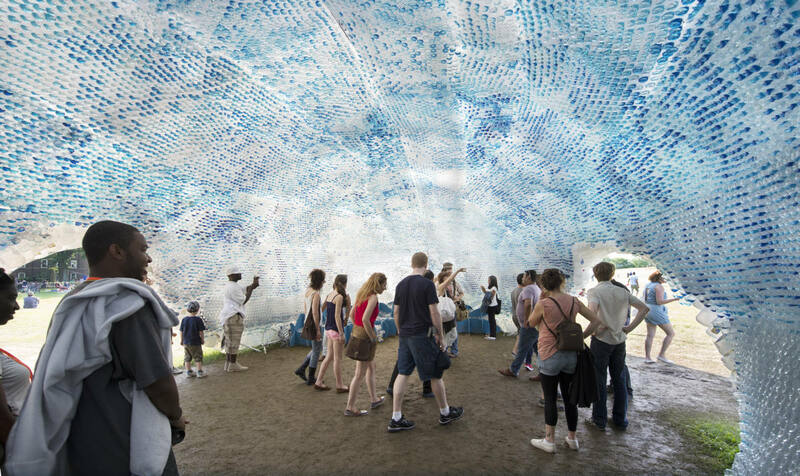 Over the course of several months StudioKCA collected used bottles from organizations, businesses, schools, and individuals throughout New York City and beyond; the bottles were then repurposed to construct the pavilion. 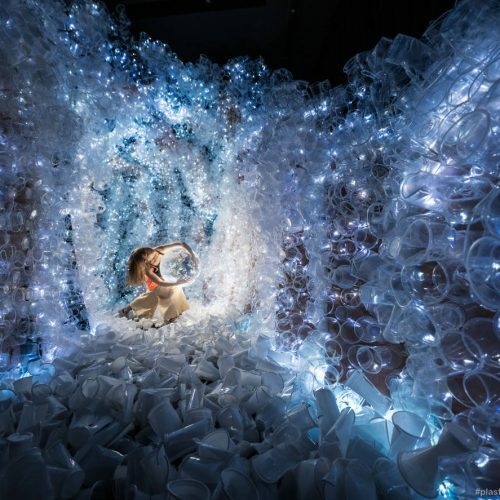 “The Head in the Clouds pavilion not only stands as a visual and physical example of the more than 60 million plastic bottles thrown away in the U.S. every day, we hope the process of creating the structure provides an example of a viable design and construction strategy of a more sustainable way of living and building—something we know is not a dream that is too far away" - Jason Klimoski, Principal, StudioKCA.